This is such a gorgeous and simple salad that I love having in the fridge. It goes well with everything and I love pairing it with leftovers. The vegetables are roasted in garlic and balsamic vinegar so they melt in the mouth and I love the subtle nuttiness and crunch of the pine nuts. Add the quinoa and stock to a medium sauce pan on medium heat and pop the lid on. 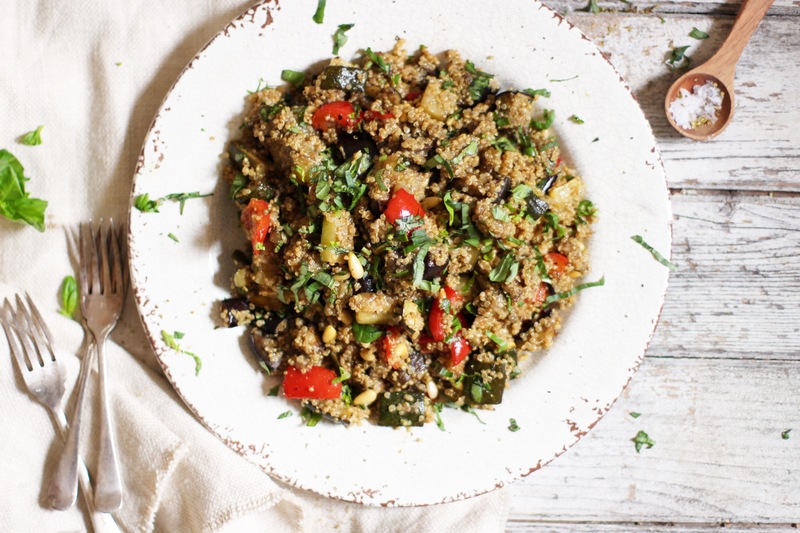 Cook the quinoa for about 13-15 minutes until all of the water is absorbed. Then turn off the heat, fluff it with a fork and pop the lid back on, leaving it to steam for a few more minutes. Chop the aubergine, courgette and pepper into small cubes and add them to a lasting tray. Mince the garlic and sprinkle it over the vegetables along with the dried oregano. Drizzle on one tablespoon of olive oil and one tablespoon of balsamic vinegar and toss everything well. Sprinkle on some sea salt and pepper and roast for about 30 minutes until cooked. Leave the quinoa and vegetables to cool while you toast the pine nuts. Add them to a pan on medium heat and cook for a few minutes until golden. Finely chop the basil and add it to a large bowl with the pine nuts. 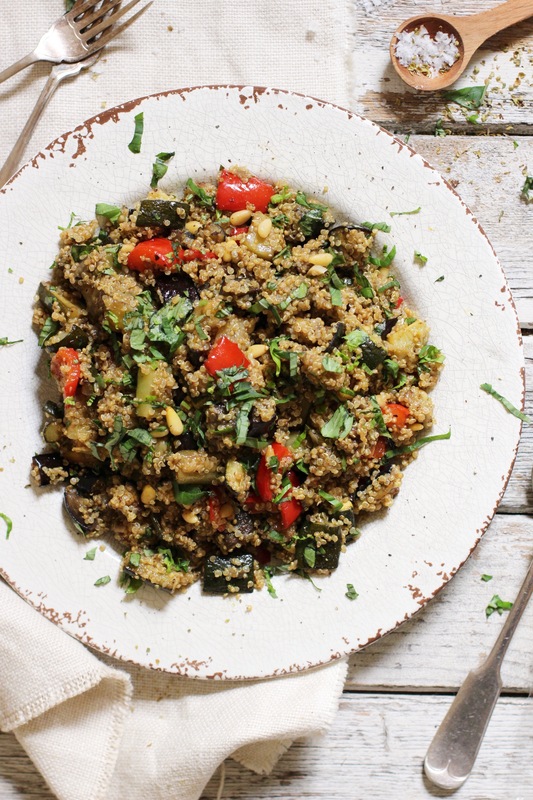 When the quinoa and vegetables are cool, add them to the bowl. Drizzle over 2 tablespoons each of balsamic and olive oil and toss well before serving. A bit confused, recipe says 1/2 cup of stock = 500ml?? How long will it last in the fridge for please? !